On the first day of Summer I was invited to help launch the Randwick Council’s innovative new ‘beach library’ on Coogee Beach. 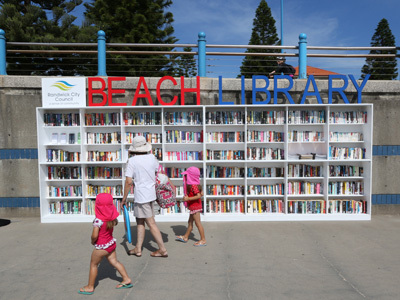 Consisting of a set of big white waterproof bookshelves with more than 1000 books and magazines, beachgoers are free to borrow any books that piques their interest for a day or a week. I love that this is based purely on an honour system, and hope the Randwick Council’s trust in its book-loving beachgoers is repaid in a successful summer for the library. The reason this is such a great idea is because the beach is a great place to lose yourself in a book. Books offer escape from our daily lives, taking us to new places, or introducing us to strange, exciting, unknown worlds. Beaches too, offer us a chance to escape, physically and mentally, from the world around us. This is why a great book is a must-have for any beach bag: it consolidates the sense of escape we can find in a day at the beach. Go on Sydney – get yourself to Coogee and grab a great beach read! Want to know more? Watch this short clip of the library construction and launch. This entry was posted in Uncategorized and tagged beach library, Coogee Beach, Coogee Beach Library, Randwick Council. Bookmark the permalink.